The primary lift station that services 90% of the town of Porter, Ind., recently underwent a major upgrade to its 100-year-old infrastructure, which the town has worked diligently to improve over the past five years. After a flood in 2008 devastated the northwestern part of Indiana, including Porter County, the town took action. The heavy rainfall produced more than 9 in. of rain within a 24-hour time period. A considerable amount of the damage from the flood occurred across the northern part of the town, where the primary lift station was built, resulting in an overflow to the Calumet River. When the existing station was unable to keep up with the significantly varying influent rates, the town upgraded from a single 6-in. force main to one 8-in. and one 12-in. force main with automatic valves. The town of Porter required the station to handle all of the flow that it receives while also maintaining flow rates during a 100-year rainfall event. As a result, the upgraded station was designed to eliminate any overflow occurrence into the Calumet River. Metropolitan Industries Inc. supplied the controls, prefabricated building, prefabricated piping, standby power generator, valves and instrumentation to this quadraplex sanitary lift station, which includes four submersible pumps. 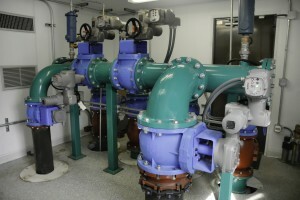 With capacity for future expansion in mind, the fourth pump was installed as a standby. Metropolitan was responsible for all process equipment and prefabricated building design. 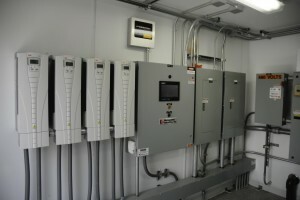 The upgraded control panels were custom designed and built into the original SCADA system. The station houses two separate force mains, automatic valves and four pumps. The entire equipment upgrade is housed in a self-ventilated, prefabricated pumping station, and was designed with a small footprint to fit the town of Porter’s green initiative. The control panels were custom designed and built into the original SCADA system to track history, flow data, and dry and wet weather events, and serves as a secondary tracking system to provide Porter Public Works with additional verification. The control system has the capability of knowing which of the two force mains are in service, and distributes flow to the force mains, depending on flow rate to maintain scouring velocities and prevent plugging. The varying flows and parallel force mains are ideal for the incorporation of variable frequency drives and electric actuated valves. Each pump operates at the speed determined by the controller so that the discharge rate matches the influent rate and uses the necessary amount of electricity to meet the pumping demand. The flow of each pump is metered by means of a magnetic flowmeter. The flow value of each pump is summed in the controller and based on the total discharge flow value. The respective force main is selected, ensuring that the proper velocity always is present and allowing for more efficient operation. The parallel force mains, installed by general contractor Grimmer Construction of Highland, Ind., exit the station to the Chesterton Wastewater Treatment Plant (WWTP). The 8-in. force main will pump up to about 560 gal per minute (gpm); if it exceeds the desired limit, the 12-in. force main will automatically receive the flow. The force main then will automatically switch back to the 8-in. flowmeter once the flow has dropped back under 560 gpm. The 12-in. force main flows directly to the Chesterton WWTP, which helps improve capability of the sanitary sewage system along Porter Avenue and adds reliability to the sewer system in alleviating occasional storm water overflow problems. Depending on the time of day, precipitation and the current flow versus future flows anticipated from tributary developments, the influent rates fluctuate, making it imperative that the new design meets all the needs of existing and future flow possibilities. The flow averages 100 gpm during dry weather and 2,100 gpm during wet weather events. Another necessity was to eliminate confined space entry to improve safety for the public works employees and service personnel. According to Brueckheimer, the installation of safety grates was a main priority because it helps prevent falls. Due to the dangers associated with entering confined spaces, municipalities are now more than ever addressing the issues of below-ground pump stations to protect both entrants into confined spaces and the investment of the equipment installed below. Continuous improvements to the town of Porter are still in progress, but with the recent lift station upgrade preventing future overflows into the Calumet River, it is apparent that the Porter Public Works Department was a major improvement for Porter County.